Chart of a Medical Professional as per Astrology. Today is another article on various professions as per Astrology. It is regarding chart of a Medical Professional. Lots of things can be very similar to the chart of a Legal Professional - https://www.astrosaxena.com/Law as the main house related with both profession is same, i.e. The 6th house but still there will be some other important additions too. 6th house – 6th house is main house related with diseases, illnesses and health care. 8th house – 8th house is house of service to people, accidents, emergencies and surgeries . 12th house – 12th house is main house of Hospitals. 4th house – 4th house represents Private Places where only limited people can enter. Hence, it represents Operation Theatres. Water Signs – Water Signs especially Cancer and Scorpio are important signs here as Cancer is sign of taking care of people and Scorpio is sign of Accidents, Surgeries and Death-Rebirth Scenarios. Virgo – Virgo is represented by a Lady standing on a boat with Wheat & Herbs in her hands. Hence, it is a sign of health care. Aquarius – A Sign of Serving Humanity. It becomes prominent because of presence of Satabhishak within it and we will know why? Jupiter – It represents Biology, so it can be an important planet in making someone go in medical field but again, as Jupiter is basically a Teacher, it can show someone as Teacher/Professor in Medicine. Saturn – It is the main karaka of diseases, illness and misery. It also represents service to people. Mars – Mars represents Bloodshed and specially with Ketu, it can represent someone who is a Surgeon. Moon – Moon represents taking care of others. Venus – Venus’ highest representation is Service and Devotion. So, Venus in good dignity shows someone who can dedicate life in serving others. Rahu – Rahu represents Drugs and Medicines. It would also represent all the new inventions in any field, including medical. Ashwini – Ashwini is connected with twin-Gods Ashwini Kumars who are known as Metaphysical Healers. But as Ashwini Kumars were Horse-Gods, normally the prominence of this nakshatra makes someone a Veterinary Doctor. Bharani – The main Deity of Bharani is Lord Yama and it is nakshatra related with events of life and death. Hence, it can be a prominent nakshatra for medical profession. Ardra, Punarvasu and Pushya – These 3 nakshatras come in a sequence and they all represent things related with medical care. Like, Ardra represents traumatic/violent/transformative events. Punarvasu represents rehabilitation time after traumatic events. Pushya is about taking care and nourishing others. Hasta – Hasta is middle portion of Virgo. It is represented by Hands and related to someone who heals others by his hands. So, Hasta is very much a nakshatra of healing and health-care. Anuradha – Likewise, Anuradha is middle portion of Scorpio, a sign of surgery, and it is ruled by Saturn, a planet of serving others. Moola – Moola represents someone who is very good at research and who can dig deep. Hence, it is prominent nakshatra for Surgeons. Satabhishak – The most prominent nakshatra of Healers is Satabhishak as the name itself means 100 physicians/healers of the God. So, when Satabhishak is prominent in chart, these people get involved in some or the other healing activities. They are the most natural healers and they can heal others without even being a professional. Revati – As it is the final nakshatra and represents the liberation time of Soul, it also gets connected with illness, diseases and hence, Health-Care. Various Combinations - Now, any combination between these houses, planets, signs and nakshatras can create a Medical Professional. 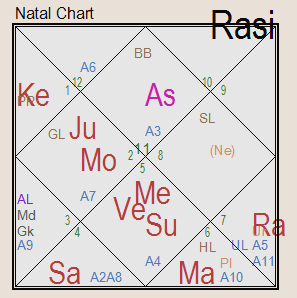 Any combination between these planets, houses, signs & nakshatras where energy exchanges between them will be enough to make a Medical Professional in proper dasha time. Atma Karaka or Amatya Karaka - If Saturn or Moon becomes person's Atma Karaka or Amatya Karaka, then things can be more prominent to become a Medical Professional as these planets represent service and taking care of others. Sometimes Mars can also show the same thing as it can represent a Surgeon. Mahadashas - But as always, dashas will activate houses or planets and person will have realization at that time to take up Medicine as Career. Example Chart – This is a chart of someone I know. Person is not a Doctor Professionally as they don’t have a degree but still they are better than those who have degrees. Aquarius Ascendant – A life path of Serving Others and Serving Humanity. Satabhishak Ascendant Nakshatra – As it is nakshatra of 100 healers, the life path will remain towards healing others. Saturn – Ascendant Lord Saturn, which itself represents miseries, illness and service, is in 6th house/Cancer. 6th house is main house of diseases and health care. Cancer is main sign of taking care of others. Pushya – Then Saturn is also in own nakshatra Pushya which represents nourishing others and that makes it very clear that where this person’s life path is going. Mars – Mars in 8th house/Virgo also shows that actions/efforts in healing people going through trauma in life. Moon – Moon is their Amatya Karaka and it being exalted makes it a good chart for health care services.